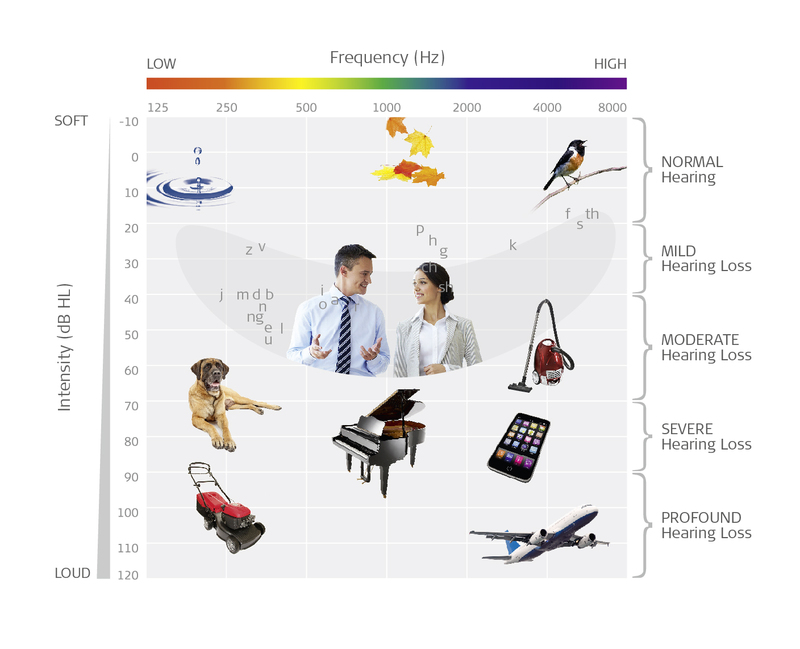 Sound is all around us, but do you really know the answer: what is sound? As Melissa Waller showed in her 5 Amazing Facts About the Cochlea post, sound and hearing aren’t the same. 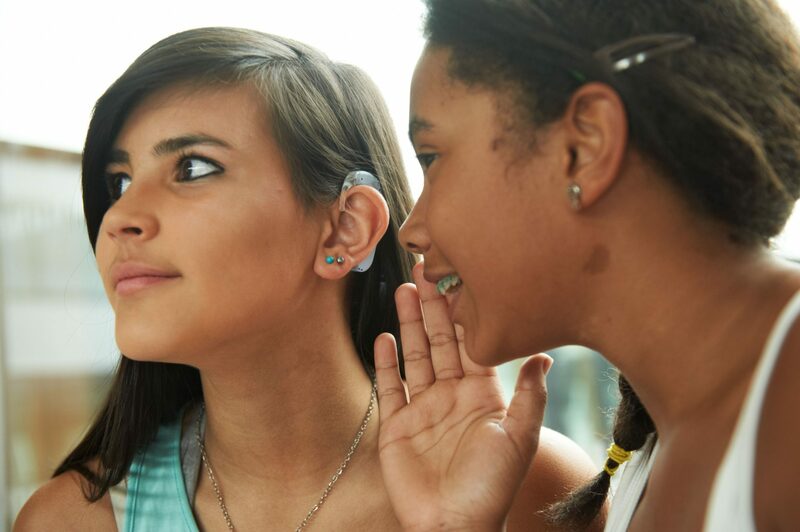 Hearing is the way that your body interprets sound, and without ears and brains there would be no such thing as hearing. Sound really is the essence of all hearing implants. There are lots of different terms and abbreviations that are used when people talk about sound, and we want to give a brief overview that explains just what they mean. Sounds are waves. Just like ocean waves, sound starts when one molecule pushes another molecule in a certain direction. These particles can be almost anything that you see: gasses, liquids, solids, and plasmas. If there is enough energy, the particle that is pushed will itself push another particle. When this continues, a sound wave is created. Because there are lots of different sound waves, a few different terms have been created to describe the properties of a specific sound wave. Two of the most common are intensity and frequency, and if you’ve ever seen an audiogram you might be familiar with both of these. The loudness of a sound depends on the force with which each particle pushes the other. When the force is greater, the sound is louder. This loudness is described with the term “intensity” and measured with units called “decibels,” abbreviated as “dB”. 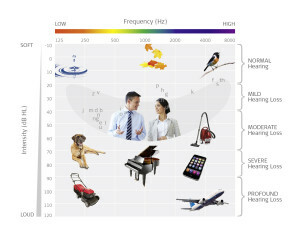 Most humans can hear sounds as quiet as 0 dB and as loud as 120 dB or more – although we don’t recommend listening to a 120 dB sound for very long because it can easily damage your hearing. But how loud is a decibel? A sound of 0 dB is about the quietest sound you can imagine, like leaves rustling in the distance, and 120 dB is about as loud as standing right next to the engine of a jet airplane. An increase of 10 dB means that the amplitude doubles: a sound of 40 dB is twice as loud as a sound of 30 dB. Frequency is the term used to describe how high or low a sound it. How high or low a sound is dependent upon how quickly a sound wave vibrates: quicker vibrations make higher-frequency sounds and slower vibrations make low-frequency sounds. This frequency is measured in units called “Hertz,” abbreviated as “Hz.” Most humans can hear sounds as low as 20 Hz and as high as 20,000 Hz. Sounds near 20 Hz are extremely low, like the roll of thunder, and high-frequency sounds like a bird’s chirp are closer to 20,000 Hz. Although a 1 Hz sound is too low for humans to hear, it can be measured: a sound of 1 Hz vibrates at one cycle per second. This means that a sound of 20 Hz vibrates at 20 cycles per second, and a sound of 20,000 Hz vibrates at 20,000 cycles per second. On an audiogram, the highest-amplitude sounds are at the bottom and the highest-frequency sounds are at on the right. See how the bird’s chirp is near the top and far to the right? That means it has a very low intensity and a very high frequency. The shaded area in the middle is where most human voices occur with sounds like “j” being lower in frequency and “s” being really high in frequency. If you’d like to learn more about sound you can also watch our our YouTube playlist “MED-EL Sound Coding in Depth,” or learn how hearing works at the MED-EL website.